First, this book can be used as a personal devotion. Simply go through the devotions, read the scriptures and answer the questions. Allow God to open your heart to the message He has for you, let His desires change your spirit, mind, and actions. Use the questions to help apply the biblical truths to your life, the scriptures in the further study section to dig deeper, and the personal devotion guide for further help. Second, LOST Lessons can be used as a small group study. It is designed to help you facilitate an effective small group using the TV show �LOST� as a catalyst for discussion of spiritual issues. Use the clips from the show to introduce the topic, the devotions as discussion starters, the scriptures for study, and the small group resources provided for more help. This book is a guide to help you facilitate a small group that draws people to a closer relationship with Christ. God desires warriors not wimps. All of us, on a daily basis, fall short of being the person God has created us to be. In Obedience Is Not For Wimps: It�s For Friends of God, William Franklin uses fact-based anecdotes, spiritually solid references and doctrine, and his own relatable humor and personal experiences to explore 101 ways that we wimp out on God�everything from cheating on our taxes to those �little white lies� we don�t think will hurt anybody�and details exactly how we can combat our wimpy ways and experience the true purpose and glory of our Heavenly Father! This is a book complied of my personal encounters with God. It is written to inform the skeptics, the believers and nonbelievers, and those who are not sure what to believe when it comes to the unexplainable. I know that God is real. I have had encounters through dreams, visions, and discernment, auditory and inspirational writing. God can use any of us to warn others about unexpected events. Since moving to Florida after several losses in my life, God has had the opportunity to use me beyond my imagination. I have had several encounters with God that have proven to be true. At times I wasn�t sure what to say to the persons that God was directing me to talk to. I was afraid, and I doubted myself. I would get the same question asked over and over again, "How do you know these thing about me?" My response is always the same, "I cannot explain it, it�s God�s business. It�s not about me, It�s all about Him. 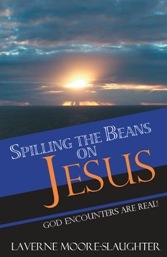 I�m just Spilling The Beans on Jesus. Why is There a Lemon in My Fruit Salad? If you occasionally find yourself in a sour mood, wanting to kick the cat or fire your boss, then this book is for you. Pamela Gossiaux can help you look at life�s difficult moments through laughter (and sometimes tears) as she shares her own struggles to become the person God wants her to be. In Galations 5, God asks us to cultivate the fruit of the Spirit�love, joy, peace, patience, kindness, goodness, faithfulness, gentleness and self-control; but through her own trial and error, Pamela has found out that lemons are definitely NOT a fruit of the Spirit! Always ready to chat about her misadventures, Pamela shares with the reader how she tries to stay sweet even when life turns sour. She talks about her trials with health, jobs, marriage, grief and more as one thing after another hit her and her family throughout the early years of her marriage. Through personal experience, she knows that God wants the best for us and will never forsake us. But sometimes He has to let us come to the end of our rope and slip off before we�re ready to let Him catch us. It�s then, and sometimes only then, that we can find true joy. Bitterness can become a thing of the past. So grab a cup of tea, a box of Kleenex and let the cat curl up on your lap because this is a book that, once you start reading, you won�t want to put down. In Words from Heaven, Rose Dyer blends humor, life experience, and a God-given gift for words to create a devotional work unlike any other. These are words from God, spoken to a woman who knew exactly how to hear them and relate them to the challenges we all face on a daily basis. Rose�s spiritual journey is played out in the pages of this book, and her conversational style and real-life examples allow her readers to know that the God who speaks so clearly to her can speak just as clearly to them if they will open their hearts to Him. Enjoying Prayer: Study Guide and Personal Reflection Journal is designed to complement the book, Enjoying Prayer; God�s Most Intimate Gift, which was written to help Christians re-discover the beauty and joy of prayer and to help the reader come into a deeper more confident walk with God. Let us then approach the throne of grace with confidence, so that we may receive mercy and find grace to help us in our time of need (Hebrew 4:16 NIV. The Enjoying Prayer: Study Guide and Personal Reflection Journal can be used individually or in small groups as a tool to help Christians move from little or no prayer life to one of sensing and walking in the Lord�s presence daily. 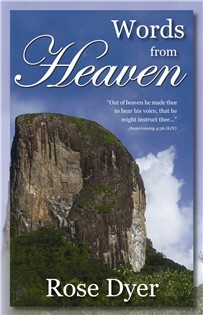 The guide includes thought provoking questions about prayer along with an area to record your answers. It also contains journal pages which can be used to capture your personal thoughts, reflections and revelations. The combination of the book, Enjoying Prayer; God�s Most Intimate Gift and the Enjoying Prayer: Study Guide and Personal Reflection Journal will amplify and enhance your prayer life and assist in taking you to new levels of intimacy in Him. Have you ever felt your prayer life lacked luster? That it could be more than it actually is? That prayer has become a devotional chore instead of a heartfelt desire to spend time with your Heavenly Father? 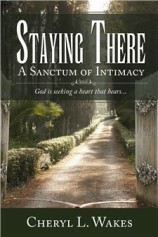 In Pastor Jerry�s newest book Enjoying Prayer; God�s Most Intimate Gift it is his desire to help Christians to recover the beauty and joy of God�s gift. A special gift, when understood correctly, that draws us into a deeper, assured walk with God. Pastor Jerry emphasizes that until we understand the joy and power of prayer, our prayer life will be nothing more than a morning ritual that we do out of habit or a sense of obligation. Consequently, we miss the great joy and privilege of entering into the Lord�s presence. Enjoying Prayer will help Christians move from little or no prayer life to one of sensing and walking in the Lord�s presence daily. It lays a scriptural foundation to why prayer is God�s most intimate gift. It removes the myths of traditionalism and ritualism and reveals prayer�s true purpose�getting to know the heart of God. If you desire to take your prayer life to a new level of intimacy and fulfillment, than Enjoying Prayer is the book for you. 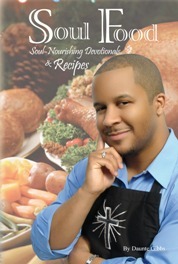 You�ve heard that the way to a man�s heart is through his stomach, but in Soul Food: Soul-Nourishing Devotionals and Recipes, Daunte� Gibbs proves that the way to a man�s or woman's soul is the Word of God! Combining inspiring devotionals that everyone can relate to with delicious recipes that anyone can make arranged by the season. Gibbs deals with relevant issues such as Remaining Thankful in the Face of Obstacles to instead of waiting for some else to do something different for you to "Be the Change." 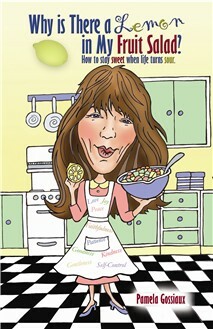 Recipes include Divine Potato Salad and Soulful Collard Greens, among others. This is comfort food at its homemade best, paired with spiritual anecdotes and the Word of God, Soul Food provides exactly what its name implies nourishment for soul, body, and spirit. 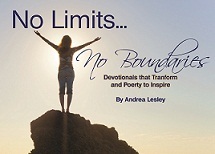 Twelve devotionals and twelve recipes that will keep you coming back for more. Are you a doer of the Word of God, or are you a hearer only? This is the great dividing line of Christianity! In Church Folks, the author, Algereida Cherry, blatantly and without hesitation or apology, lays it all on the line as she asks the question, �Do you walk the walk, of a Christian, or are you just talking the talk? In today�s Christian society, under the dispensation of grace, many of us live a life of comfort that is centered around the warm and fuzzy aspects of Christian life. Yes, God is good, He is a God of grace and mercy, He is forgiving, and He is Love. However, love ain�t always mushy. Sometimes tough love is the only type of love that can set the captive free and bring us to our highest and greatest good in Him. In Romans 6:1 the question is raised, �Shall we continue to sin so that grace may abound?� The answer: God forbid! Church Folks is not for the faint at heart Christian. It is for the Christian who is ready to take their relationship with God and their impact on society to a supernatural level. Mrs. Cherry delineates that Christians are to change the culture to reflect God; not to be changed to reflect the culture. As Christians, we are to be the salt and light of the earth. The book reveals the problem�we have lost our saltiness, and because we have lost our saltiness, our ability to impact the culture has been diminished�and presents the solution �to be doers of the Word of God and not a hearer only. and the diminishment of pain. As a licensed counselor, I have come to see first hand in my own personal life and in the lives of others written within, that our distorted perceptions coupled with our narrow intellect do not see beyond the pain. Oftentimes this lack of insight projects our lives into a space of disillusionment and discouragement; the result is an immobilization so that we are ineffective to fulfill our passion of purpose that burns within; therefore, our �reason for being� diminishes�and becomes as smoldering embers. Reigniting� �the hope is to obtain the variable necessary to rekindle what is about to die. The Hope�the One and only Hope is the fact that there is an availability of healing�somewhere and somehow. Knowing the �where� and �how� is what I have found. Every time, without exception, when this remedy, Truth Therapy, has been administered, it has brought a resolve (beyond what I ever thought possible). Mary Jo Danyluk, MAC, LLPC holds a Master�s Degree in Counseling and is a State Licensed Counselor. Also to her credit is her work as an instructor at a nearby college educating students in the arena of Psychology and Social Psychology. She has counseled inmates for years in the jail of one of the most violent cities in America, thereby administering the truths found within Peace in the Pain, and is still witnessing the positive, life changing effects of the administration of Truth Therapy. Her purpose and passion in life are to see others come to an awareness of that which holds them captive, and begin to live a life of freedom based on the Truth. Dear Sisters, Unto You Joy and Peace is a compilation of 40 daily devotional letters to uplift and encourage you while you are on your journey to our eternal home. My prayer for you as you read these 40 letters, is for you to find the comfort that Jesus Christ experienced while in the wilderness those 40 days�for it is written, that we should not live by bread alone, but by every Word that comes from God (Matthew 4:4).